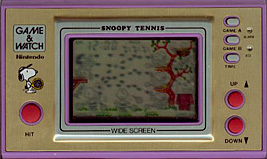 Charlie Brown and Snoopy are playing tennis. Charlie is hitting the balls and Snoopy has to climb onto the branches of the tree and swing his racket to return them. Lucy also butts in to hit the balls returned by Snoopy. You score 2 points for every ball returned from Charlie Brown and 3 points for every ball returned from Lucy. If you miss then the ball breaks some bottles. Three misses and the game ends. When you reach 200 and 500 points any misses you have are cleared. If you have no misses at 200 or 500 points then Chance Time begins, where you get 5 points for returning Charlie Brown's balls and 6 points for returning Lucy's balls. Return the balls hit at Snoopy by Charlie Brown and Lucy. The number and speed of the balls is increased.